Another first from us . . . wine making without a syphon. 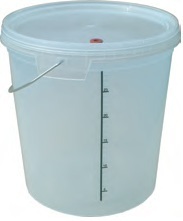 Select the free 30 litre primary fermenter upgrade for fast fermenting wines. Syphoning is messy, prone to infection, very difficult to control, and usually moves sediment and introduces air into your wine. All very bad for the wine. Here's the problem: some wine making techniques (and wine ingredient kits) require racking to be performed twice, and others require racking three times or more. So, if your wine making equipment has fermenters, or a fermenter and carboys, it can be hard to figure out which vessel the wine will be in at bottling time. And you need a syphon to move it from one vessel to another. And the solution: bottle filling technology coupled with taps and tubing installed on both fermenters. Wine is moved from one to the other by simply attaching a tube (supplied) to the tap in one fermenter, placing the other end of the tube in the other fermenter,and opening the tap. This is much easier than using a syphon, is much more controllable, and introduces little or no air and sediment into your wine. When wine is ready for bottling (in either fermenter), just attach the bottle filling stick and fill the bottles, again minimising air contact. Does not come with a wine ingredients kit, so you will have to buy one separately. As a beginners kit, we love the Cantina range because they produce a reasonable quality wine in just 5 days, particularly the Pinot Grigio which is very drinkable! For those of you that can wait a few weeks or more, the Advintage wines from Canada are among the best kits availaible.